Looking for the perfect connection between the music storage, a notebook with foobar2000, and my Devialet Expert 200, I opted for an USB cable, not for Devialet Air over Ethernet or Wi-Fi. In my setup this is the most reliable connection with the shortest response times for foobar2000 remote control using an Android tablet. It turns out that the sound quality of an USB audio connection depends on the cable used, so I did a systematic comparison test. Available were a standard USB computer cable, an AQVox USB cable and an Ultimate Silver Dual USB Interconnect from Lavricables.com. All cables were compared only after a break in period of at least 100 hours as an audio USB connection. A difference by breaking in was only noticeable with the Lavricables Ultimate, but there very clearly. 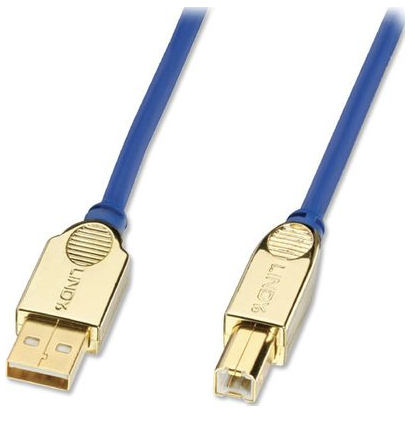 The USB computer cable has always worked reliably, the sound was fine, no emphasis on a particular frequency range. However, there was no warmth compared to the AQVox, timing and localization of the instruments were not optimal. The revelation for me is the Ultimate Silver Dual USB Interconnect from Lavricables: the space contained in high-quality recordings gains in size and contour, the precision of the performance is terrific! I discover micro-details that were previously hidden, there is no sharpness in sibilants, yet crystal clear and sparkling heights. I have deliberately chosen this cable construction because here the data lines are shielded and kept separate from the power lines, but only 1 USB A plug is used. So I can additionally use an ifi iSilencer 3.0 at the output of the notebook, which I knew would improve the sound with cheap USB cables. In my setup the effect of the iSilencer with all USB cables was about the same, even the fantastic Ultimate Silver Dual USB Interconnect by Lavricables improves further. For me, this combination is by far the best connection for the feeding of my Devialet, and compared to well-known suppliers (Kimber KS2436, Audioquest Diamond, ...) at a VERY decent price! Early Christmas present from the UK this year is a Chord Shawline USB cable. Current time: 18-Apr-2019, 13:45 Powered By MyBB, © 2002-2019 MyBB Group.